It seems that an increasing number of westerners are making the bold move to relocate their families to China and other parts of Asia in an attempt to give their children a leg up when it comes to learning Chinese. In a recent WSJ online article, Sarah Tilton and Joanne Lee-Young wrote about several American families, all with young children, who had discussed the advantages of moving to Chinese speaking countries in order to immerse their children in Chinese language and culture. These families represent a growing trend of parents who want to give their children an edge amongst China’s global influence and population of 1.3 billion people. China’s status makes Mandarin one of the fastest growing must-learn languages. 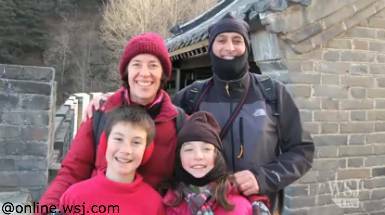 In 2010, Michael Roemer, a Californian attorney, moved to Chengdu in western China with his wife and two children, with the sole aim of giving his kids an up-close look at China and a much greater chance of learning the Chinese language to a high standard. Mr Roemer believes that learning Chinese is good for his children’s brains and that mastering the challenge of learning the language gives them a great deal of confidence. “Speaking Mandarin is important,” says the 57-year-old Mr. Roemer. Total immersion in the language, country, and culture is an increasingly popular way these families address the arguably difficult nature of learning Mandarin, a tonal language with thousands of characters to master. For these western families, it’s not enough for their children to attend after-school or extracurricular language classes in their homeland. Even learning options such as hiring Chinese-speaking nannies, hiring professional tutors, skyping with native Chinese speakers, or even enrolling their children in local Mandarin-immersion school programs are not good enough. Please note: Whilst we do not cater for children here at Q language, we do encourage adults from around the world to join us here in Hong Kong, immerse yourselves in rich Chinese culture and start to master either Mandarin or Cantonese by becoming a student on one of our renowned Intensive Chinese courses. Full details here. We are looking to re-locate to China and find a program for our kids to be immersed in Chinese. Maybe a bi-lingual school or intense language program for foreign children? I understand that most of the American and International schools do not make the kids even close to bi-lingual. Could your program help us in finding such a program, anywhere in China. Thanks for your enquiry, Samantha, we have replied to you via email.